1Q16 earning season confirmed several business trends. Ad driven businesses showed strong. Smartphone and PC sales were weak. The enterprise migration to the cloud continued apace, while traditional IT suppliers struggled. AMZN sharply accelerated its e-commerce sales in a tough retail environment, while sustaining profitability. We had written our concerns for the OTA and GDS travel businesses (http://www.ssrllc.com/publication/otas-wanna-get-away/) – 1Q16 results were mixed, with recent consolidation playing more smoothly than we expected. 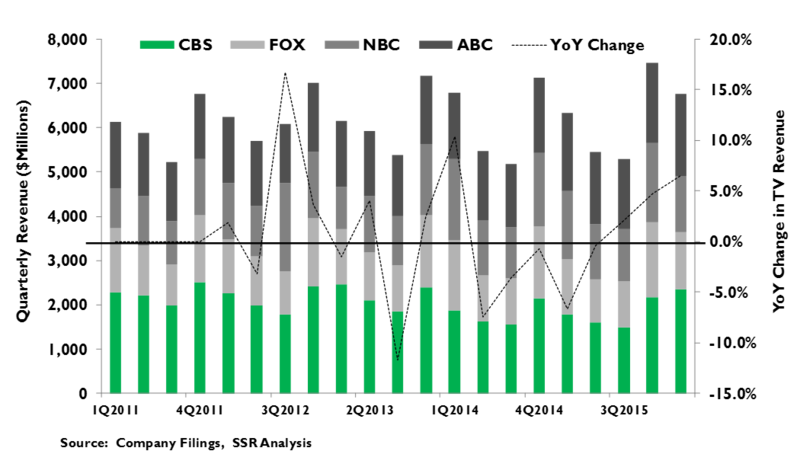 We expect the security market to shake out in 2016 – 1Q was a start, with a few beats and a few more sharp disappointments. Against this backdrop, our long model portfolio slightly underperformed, with STX the big loser. We are removing it and DATA, and adding MLNX and LNKD. Our short model portfolio had more pronounced underperformance, due to ill-advised bets against linear TV. We are pulling shorts on CBS, CHTR and IPG, replacing them with HPE, DISH and NUAN. US advertising is red hot. TV execs are basking in strong 1Q16 results, driven by the unusual presidential campaign, which added direct ad spending and boosted news ratings, while tightening the scatter market for other advertisers. Nearly every media company not named Viacom turned in strong TV revenues, despite continued deterioration in the size and quality of their core audiences. CBS CEO Moonves crowed that his 12% organic growth represented market share recovery from digital rivals, but FB blew out earnings with 58% ad growth and GOOGL posted 23% growth, after TAC and FX. With audiences shifting their attention online, particularly in the most coveted demographics, we expect a serious snapback in media ad sales in 2017, once the campaign and Olympics are over. Meanwhile, everyone can enjoy the rising tide. Devices are ice cold. Industry analysts Gartner and IDC set the stage by lowering their PC forecasts ahead of the quarter results. It should have been no surprise that many PC linked names – HPQ, INTC, STX, WDC, etc. – missed estimates. MSFT is a bit of a mixed story – it suffered on PCs, but delivered stellar cloud results. Smartphones also disappointed, with AAPL’s big miss the main story. We expect global replacement rates to continue to lengthen (http://www.ssrllc.com/publication/smartphones-mobile-maturity/), and see little to no market growth going forward beyond the very low priced segment. The cloud is rising. AMZN’s AWS and MSFT’s Azure continue to take swaths of share in IaaS, growing 64% and 120% respectively in 1Q16. SaaS companies are also showing well again. 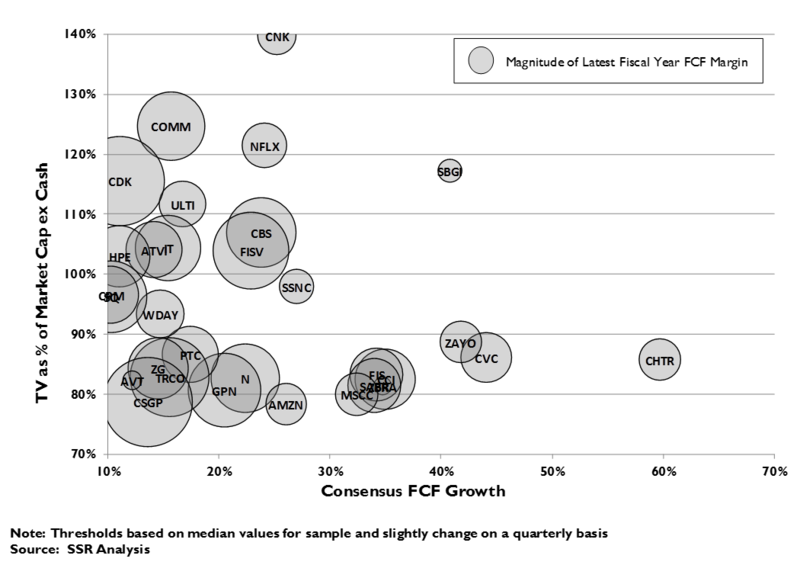 Many, including CRM, have yet to report, but a few that have – LNKD, NOW, SHOP, ZEN, and others – delivered strong results. Two others, OPWR and TXTR, were acquired by ORCL in the quarter, another indication of the attractiveness of the group. AMZN is killing it. We were concerned that consensus forecasts of 1Q16 sales acceleration off of a blistering 28.2% YoY pace despite a weak overall retail environment, and beat on EPS to boot. AWS got many of the headlines, but AMZN’s e-tail business is doubling the growth of the online market from the leadership position. Increasingly, e-commerce looks like a rout. OTA consolidation is working. We remain cautious on the OTAs and GDSs, as the tepid economy, increasing resolve of hoteliers and airlines, and the rise of new competitors (i.e. AirBnB) are obvious threats to the high growth expectations and fat margins in the group. 1Q16 showed little impact from these factors, as the benefits of recent consolidation played earlier and stronger than we expected. We remain concerned for 2H16 and beyond (http://www.ssrllc.com/publication/otas-wanna-get-away/). Security shakeout playing out. 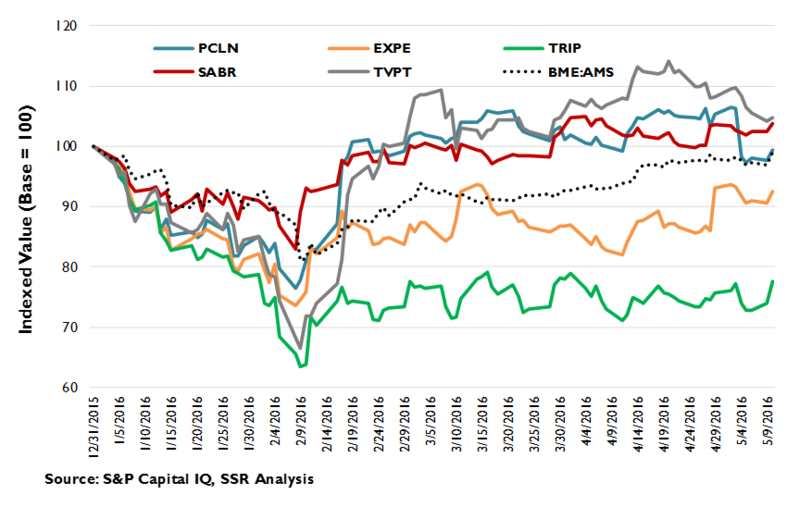 Security earnings were mixed with CHPT, SYMC, FEYE and VRSN off on misses or weak guidance, and CYBR and FTNT moving up on surprises. Generally, hardware vendors have underperformed software. As we wrote in February, we expect overall demand to weaken with basic security commoditized and more advanced solutions blocked by IT department limitations and threatened by the cloud. (http://www.ssrllc.com/publication/cybersecurity-trust-no-one/) Still, we see opportunity for a small number of differentiated leaders, such as PANW, CYBR and ANET, to prosper. Old line IT value trap. In an echo of 2014, traditional IT names – i.e. 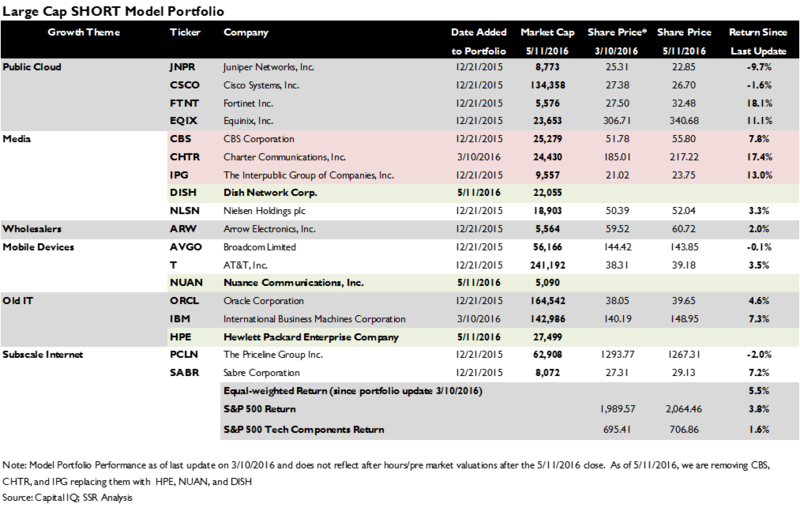 IBM, HPE, HPQ, INTC, CSCO, ORCL, and others – had been strong performers through March. Earning season seems to have clipped their wings, as reports from the group, thus far, have been disappointing. Given clear evidence of an accelerating move to the cloud by their enterprise customers, we do not expect the trajectory for these companies to improve. Pulling DATA and STX from our model portfolio. Since our last update in early March, model portfolio constituent STX has dropped 44%, holding overall portfolio appreciation to 1.2% against a 1.6% gain in the tech components of the S&P500. While we still see believe cloud storage will one day more than offset declining sales to PC and storage system OEMs, we now see the inflection point as more than a year away, prompting us to remove STX. We are also removing DATA – we believe that the recent sharp deceleration in license revenue is most likely driven by competitive inroads by MSFT’s PowerBI product. If so, we believe the growth narrative for the stock could be broken. In their place, we are adding HR SaaS player LNKD, which looks to be recovering from its Jan. tumbler, and MLNX, which we believe is well positioned to exploit a cloud-driven shift to white box networking. Too early to short TV. 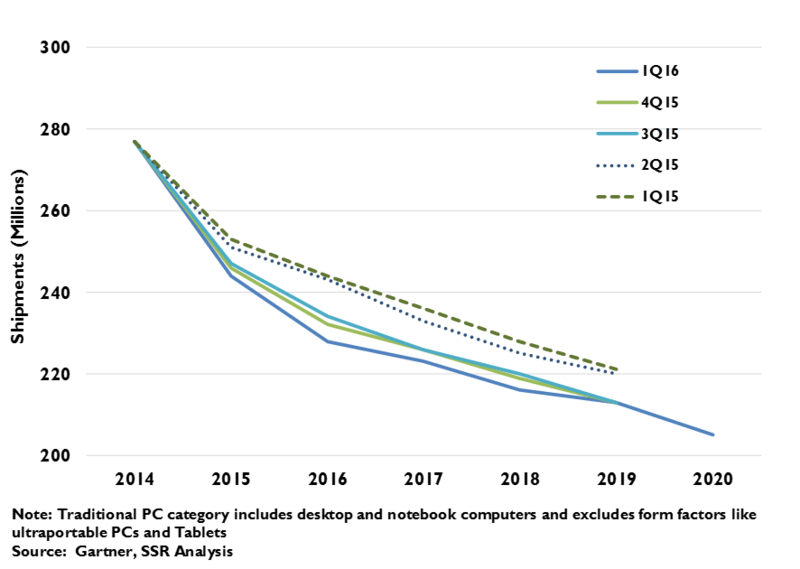 The performance of our short model portfolio continues to be poor, underperforming the bench mark by 390bp since March. 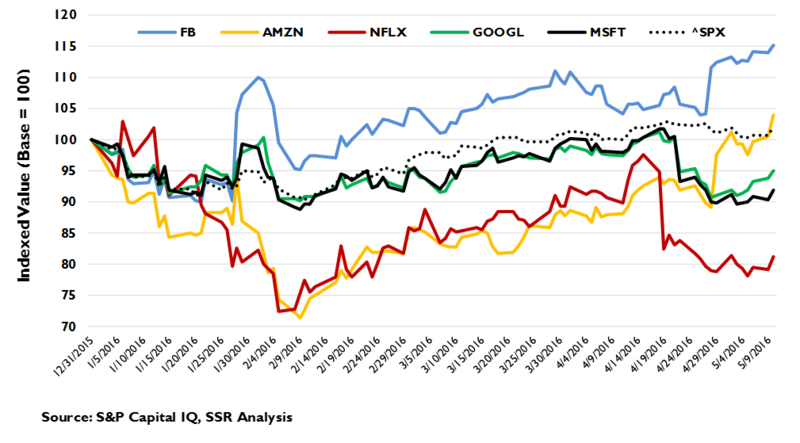 The biggest flaw in the portfolio has been our concentrated bet against linear TV, which as noted above, has dramatically outperformed. While we believe media will indeed suffer a significant downturn, the raucous presidential campaign will run until the first Tuesday in November. We will wait until then to return CBS, CHTR, and IPG to the portfolio. In their place, we will add HPE (The 1Q16 growth which sparked a 40% run in March is unsustainable), DISH (It is growing less likely that it will be able to fully monetize its spectrum assets) and NUAN (Deep learning platforms from GOOGL, MSFT and others will threaten its voice and image recognition businesses). 2016 started out as a replay of 2014, with beaten down old line IT names, media stocks and high dividend cable stocks leading while the FANGs gave back some of their 2015 gains. 1Q16 earnings season gave us a bit of clarity as to whether this dynamic will have staying power. We think strong media results will be with us most of the year, as unprecedented campaign spending adds directly to TV ad demand, strengthens ratings for news programming, and squeezes other advertisers in the scatter market, where inventory is already in short supply due to networks making good on unrealistic audience projections made during last year’s Upfronts with free spots. Still, with core TV audiences still shrinking, 2017 is likely to be a rude awakening, once political and Olympic spending is over. The strong ad environment is also helping FB and GOOGL, both of whom posted very strong sales growth. TWTR, with its real time news leadership, should have posted better ad sales numbers – a red flag that trumped a surprise uptick in MAUs. As for the rest of the FANGs, AMZN posted blow out numbers, with strength in both the surprisingly profitable AWS hosting business but also in e-commerce where it is nearly doubling market growth from the leadership position. Investors were correctly impressed. Netflix seems to have hit an air-pocket – US subscribers seem to have stalled and the cost of its international expansion are hitting the bottom line. We see this as temporary. 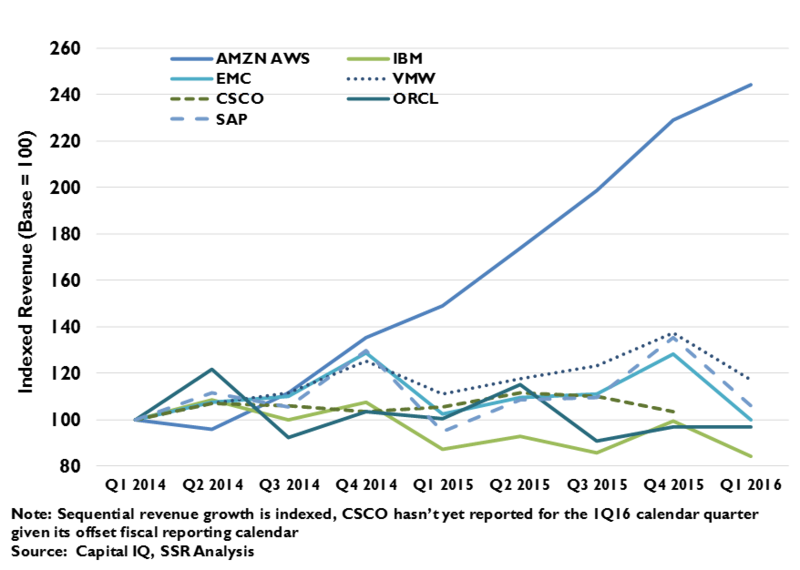 MSFT posted terrific Azure and SaaS cloud numbers, overwhelmed a bit by the harsh PC market and a tough YoY compare. We see the company as a quarter away from turning the corner to growth and not looking back. Other SaaS players – e.g. 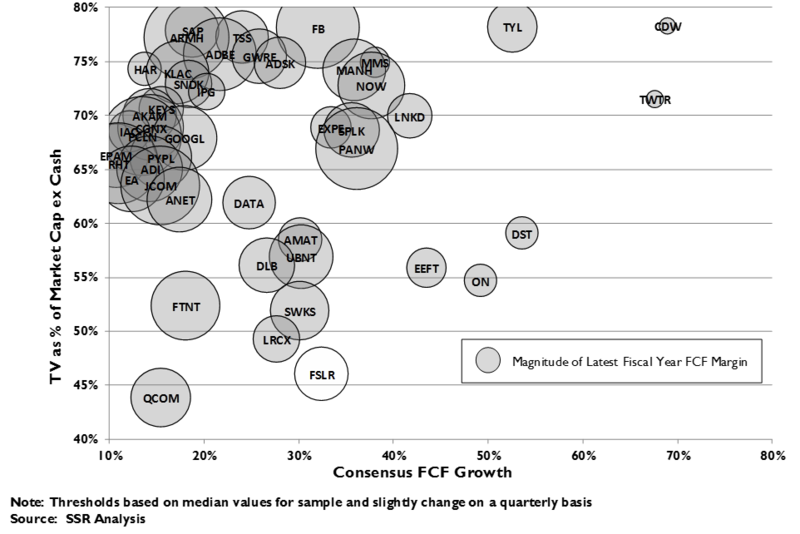 LNKD, NOW, ADBE, and others – have also been turning in strong numbers. Many component players that are straddling the line between cloud growth and declining traditional IT sales suffered in the quarter – INTC, STX, and WDC stand out. We think this will get worse before it gets better, just as we believe that the general decline in IT systems demand will only accelerate. We are similarly bearish on global smartphone sales. Our work suggests that the premium segment is close to fully saturated and that device replacement rates hit a 10 year high in 2015. Flattish unit sales and rising price competition will be bad news for both device makers and component suppliers, and wearables/IoT are not likely to make up the difference. We published bearish research on the security and online travel sectors in 1Q16. The security stocks lived up to our expectations of a serious shake-out, while OTA and GDS results were a bit more robust than we had anticipated, with several players delivering early synergies from a recent round of consolidation. We remain cautious about both sectors. Our model portfolios have underperformed since our last update in March (Exhibit 1). On the long side, this is entirely due to the 44.7% drop in STX, which we are removing from the portfolio. We are also removing DATA, which had been the worst performer in the previous period, as we believe that it is losing significant business to MSFT’s new PowerBI product. In their place, we are adding MLNX – a component play for the rise of SDN switching – and LNKD, which delivered a strong 1Q16 on its way to recovery from poorly received January report. The short portfolio performed very poorly – off 390bp. Here the biggest problem our early bet on the deterioration of linear TV – we were at least 9 months early with that. We are removing CBS, CHTR and IPG from the short portfolio, and adding DISH (diminished prospects for monetizing spectrum assets), HPE (long term declining annuity), and NUAN (threatened by new AI-based platforms from GOOGL, MSFT, etc.). 2016 started out a lot like 2014, when Apple added 40% to its market cap on the furious demand for the iPhone 6, when ‘90’s tech leaders like INTC and HPQ appreciated an average of 20%, when linear TV was still presumed to have a future, and when big dividend network monopolies were appreciated for their near-guaranteed returns. In contrast, the 2014 narrative on the FANGs was negative. Facebook finally figured it out, but Google was presumed to be the big loser in mobile, Amazon investors began to demand profits, and Netflix was dinged for its risky investments in original programming. The April earnings season saw the market deviate a bit from the back to the future narrative. Smartphone sales hit a wall, and PC sales fell off of one. Traditional IT spending returned to a slow bleed. Facebook and Amazon delivered blowouts. Google and Microsoft offered reports full of moving parts that were taken badly at first, but seem to be growing on investors with time. Still, the chest thumping from the media sector and scurry to the supposed safety of high telecom and cable dividend yields seem to have some legs. We expect the advertising surge to last most of the year, before the media sector is forced to come to grips with some really tough compares. We believe device replacement intervals can and will lengthen, and that competition will get more aggressive in Smartphones. We expect enterprise IT to turn increasingly to the cloud – good for Amazon, Microsoft and the best of the SaaS players, but bad for most of the traditional IT data center suppliers. We think that poor subscriber trends will catch up to the wireless and Pay TV behemoths, and raise questions on the long term sustainability of their dividend programs. We expect the FANGs +M to re-establish their 2015 mojo – Facebook and Amazon are already off and running, Google’s results were better than they seemed at first glance, and Microsoft will be out from under tough compares in another quarter. Netflix could be under a bit more pressure as they invest in global expansion (Exhibit 2). When the dust settles in November, some pundits believe that $6B or more will have been spent on the presidential election, a nearly 25% increase from 2012 and a windfall for linear TV, which is expected to capture 80% of the spending (Exhibit 3). 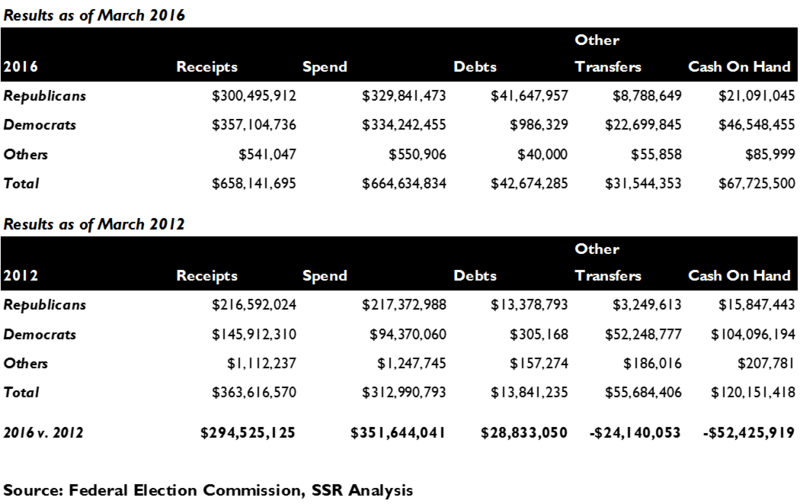 Moreover, the spending has begun early, with vigorously contested nomination processes for both parties that extended well into 2Q16. The effect of the campaign extends beyond the direct ad buys. The campaign has dramatically boosted the ratings of TV news, with CNN’s primetime audiences doubling YoY and Fox News rising to the top of all cable networks and primary debates drawing unprecedented viewership. The strong political spending helped to soak up excess inventory in the scatter market, along with make-goods by networks offering free spots to Upfront advertisers after failing to meet audience commitments for primetime entertainment programming. All in, most networks reported 6-12% higher ad sales vs. 1Q15, with Disney and its ESPN cash cow the glaring exception (Exhibit 4). It would seem that sports and politics do not mix well. CBS CEO Les Moonves offered his opinion that his company’s 12% Super Bowl adjusted ad sales growth was indicative of share recovery vs. digital ad platforms. This is very unlikely. Facebook grew its advertising revenue 57% YoY in the quarter. Google grew its after TAC ad revenue by nearly 20% in the face of 6% FX headwinds. Even Twitter, which we believe is beginning to show signs that the pressure on its stock may be weighing on its ability to sell ads, managed 37% YoY growth in advertising sales. Last year, we wrote in detail about our expectations for a significant slowdown in premium smartphone demand and the reasons for it (http://www.ssrllc.com/publication/smartphones-mobile-maturity/). Essentially, penetration of premium smartphones into the world population likely to pay for them is high and the propensity of existing smartphone users to replace them is already at an historic high and likely to recede with falling subsidies and a lack of meaningful innovation (Exhibit 5). Apple’s stark 2QF16 and weak guidance confirmed our hypothesis, with CEO Cook admitting that the iPhone 6 had, in fact, pulled forward upgrade demand and that upgrade activity had clearly slowed. We do not expect things to get materially better going forward. The rumored specs of the upcoming iPhone 7 are pedestrian at best, with a form factor the same as the iPhone 6, save for the elimination of the headphone jack. Real innovation has been pushed out to the rumored all glass iPhone to be delivered in late 2017. By then, the overall premium smartphone market is likely to be weaker still. The stock is technically cheap, but it is difficult to get enthusiastic without an obvious catalyst. Smartphones were not the only device category to take a header in the quarter. PC demand took another wrenching turn downward. PC OEMs were obviously hit, but component suppliers, many also smarting from the weak smartphone market, took pain as well (Exhibit 6). Intel announced 12,000 layoffs, Seagate and Western Digital missed their already lowered consensus targets. Broadcom started down from a March relative peak ahead of its May quarter. Microsoft 3QF16 sales were down vs. a tough YoY compare (Windows 10 release). Of these, only Microsoft has a quick road to recovery, with its strong cloud sales expected to return it to growth beginning with the September quarter. Microsoft is growing its Azure IaaS hosting business at a 120% clip. We believe that the likely profitability contribution of Azure has been obscured by an aggressive investment trajectory, and that the $2.5B run-rate business has the potential to hit the $10B mark before the end of the decade. Meanwhile, Office 365 is nearing traditional Office in revenues, while there are significant opportunities for it to grow its SaaS business in many directions. Obviously, Azure’s chief rival, Amazon Web Services (AWS) is also enjoying strong growth with sales up 64% YoY in 1Q16 and excellent overall profitability (Exhibit 7). AWS, with sales already at the $10B run rate level, constitutes nearly 40% of the hosting industry and is taking market share. We believe that Google may be the only other company with the scale and institutional skill set to challenge AWS and Azure in what could become a market worth $100B or more over the next decade (Exhibit 8). 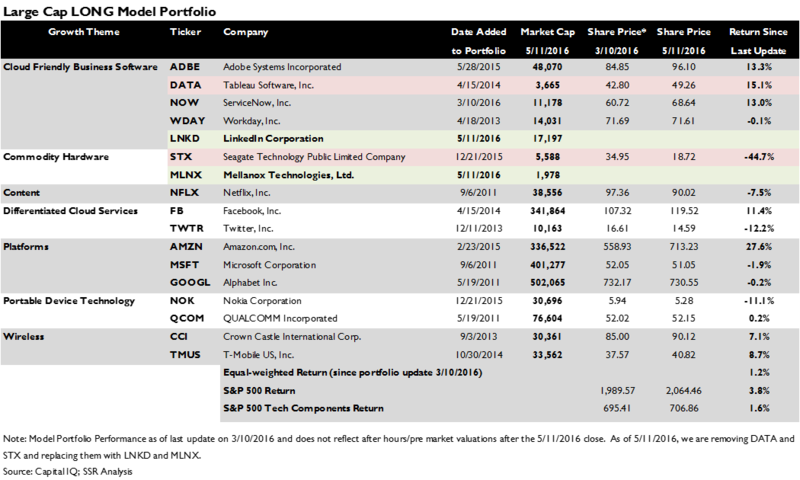 SaaS names had taken a real swoon in February after LinkedIn and Tableau Software both turned in 4Q15 disappointments. Since then, strong off cycle reports from Salesforce and Workday reversed the slide, and excellent 1Q16 results from Service Now, Shopify, Zendesk, and, particularly, LinkedIn, are contributing to the sector resurgence (Exhibit 9). Tableau followed up its previous disappointment with another one, with its license growth slowing to just 12% after having been at 54% just 6 months ago. We believe that Tableau’s problems are competitive – Microsoft’s Power BI sells for less than 25% the price of a Tableau license. We were worried about Amazon’s 1Q16. With little guidance to go on and a history of 1Q profit disappointments, consensus expected it to sustain the profitability that had been building for 3 quarters. Revenue growth had accelerated over the prior two quarters to 22% in 4Q15 – analysts wanted 23% in 1Q16. If Jeff Bezos decided to increase the reinvestment of the company’s profits, as he has often done, Amazon could disappoint. We shouldn’t have been worried. Sales were a blowout, up 28% YoY. The aforementioned AWS was an obvious strong contributor, but e-commerce sales were up 27% in a tough retail environment (Exhibit 10). Amazon is now taking more than 60% of all growth in e-commerce – so much for the “click-and-mortar” strategies of traditional merchants (Exhibit 11). Amazon may not be able to keep up this torrid pace, and Bezos may decide to make future investments that squeeze near term profits, but as long as the company keeps its eye on the trillions of dollars in opportunities that it is chasing, we see significant further value in the stock. We published a detailed look at the online travel agency and global distribution network markets in March, drawing the conclusion that the strong growth and rich margins could see pressure from hoteliers, airlines, alternative services, like AirBnB, and cloud platforms, like Google. (http://www.ssrllc.com/publication/otas-wanna-get-away/) 1Q16 results were mixed relative to that perspective. Expedia, Sabre and Amadeus all exceeded expectations, in part, owing to very smooth integration of recent acquisitions. Priceline fell on weaker than expected guidance amidst uncertainty caused by the sudden resignation of its CEO. Trip Advisor and Travelport both missed expectations. None of the companies showed much impact from the factors that we cited in our report, which we believe will likely play out over the course of the next couple of years. Our February report on cybersecurity (http://www.ssrllc.com/publication/cybersecurity-trust-no-one/) saw a maturing market for baseline protection, limits on the ability of enterprises to effectively use more advanced security products, and a threat from integrated security provided by cloud providers. We expected a shakeout, with a few innovative players like Palo Alto Networks, CyberArk, Proof Point and Arista Networks continuing to prosper but with many others disappointing against aggressive expectations. 1Q16 played out along those lines. Checkpoint and Verisign beat but offered weak guidance that saw shares slip. F5 Networks and FireEye flat out missed expectations. CyberArk, Proof Point, Arista and Fortinet all beat – we were overly pessimistic on Fortinet. Symantec and Palo Alto have yet to report. Traditional IT names were pretty spry in early 2015, but April earnings has slowed things down. 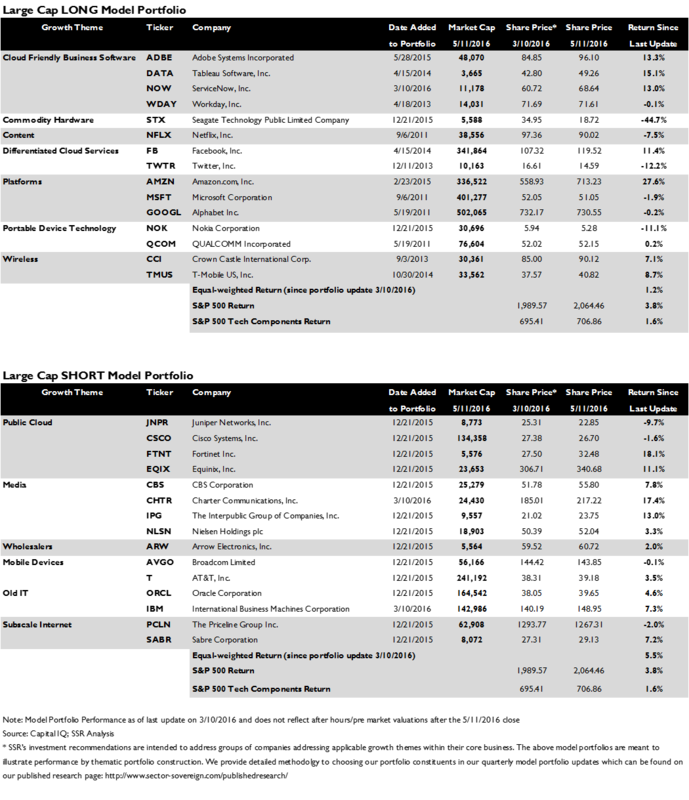 IBM, Intel, and EMC all missed, with Oracle, SAP, Cisco, and HP Enterprises all yet to report. 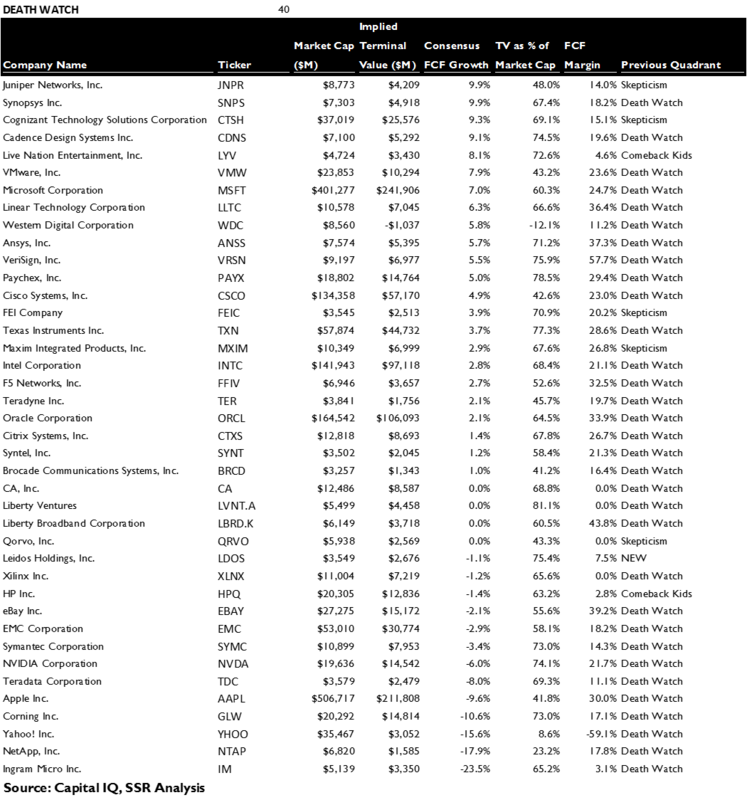 VM Ware was the big upside surprise, posting 5% YoY revenue growth and announcing a $1.2B buyback. These companies have many moving parts and see sales lumpiness around major product introductions and contract signings. While this may yield occasional surprises, we expect the long term trajectory to be unambiguously down. None are well positioned to prosper from the shift in enterprise IT to the cloud. 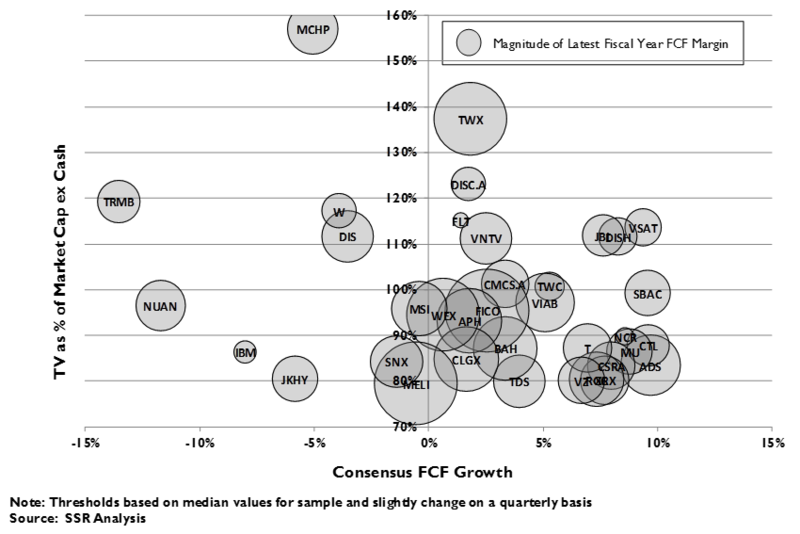 We track the universe of large cap TMT stocks according to a two pronged valuation framework. 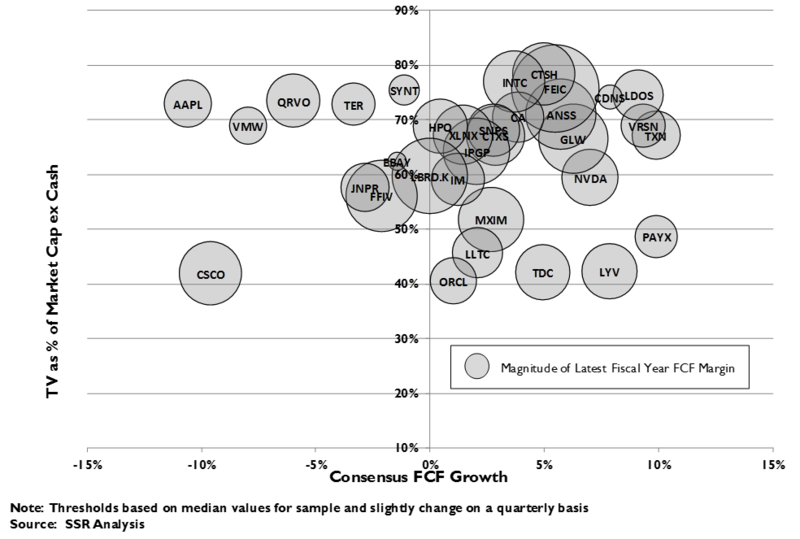 On the x axis, we range the companies based on the 5-year free cash flow growth implied by consensus expectations. 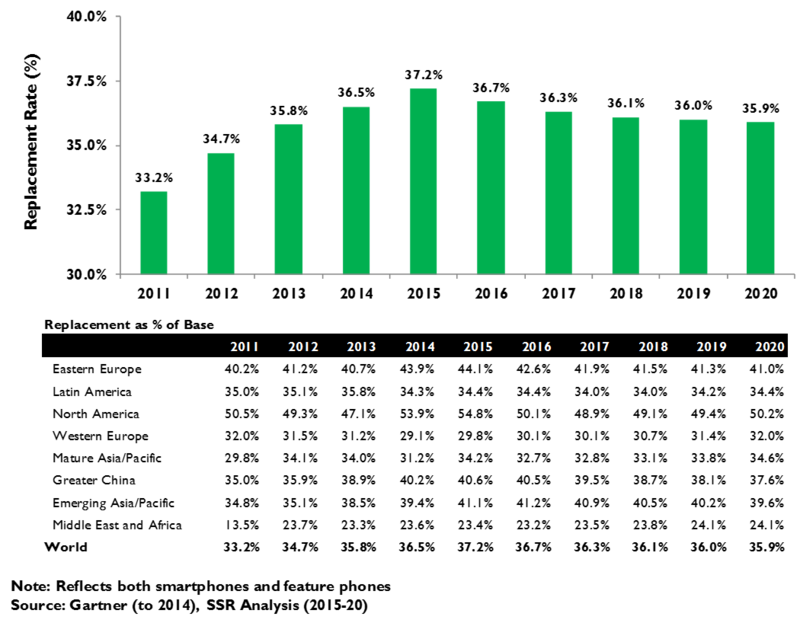 On the y axis, we plot the 5th year terminal value implied by the enterprise value of each stock, once the NPV of the 5-year implied cash flows is subtracted from the EV. Thus, stocks move back and forth along the x axis as analyst consensus projections are revised, and up and down along the y axis as the stock prices change independent of analyst estimates. We view the x axis as an indication of the portion of value projected by near term expectations and the y axis as investor projections of long term value. Breaking the plot into four quadrants, we have named them Dream Stocks, Skepticism Stocks, Comeback Kids, and the Death Watch. This period HPE moved from the Death Watch quadrant in the lower left to the Dream Stock quadrant in the upper right. This is an unusual move, marking both a marked increase in growth expectations from analysts and a corresponding surge in the share price. 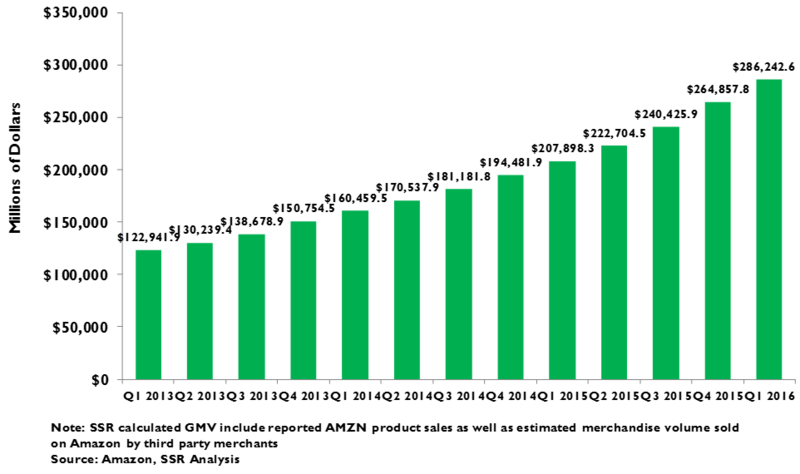 We believe that this seriously overestimates HPE’s 5-year growth potential, and its underlying long term value. As such, we will add it to our short model portfolio, and call it out as a high risk investment (See Appendix for detailed metrics). Several interesting names moved from Comeback Kids to Dream Stocks – amongst them, Time Warner, Discovery, Cablevision, Sinclair Broadcasting and Workday. This represents a warming of consensus opinion to match already optimistic investor expectations. We believe that the media names will face very difficult compares in 2017, and would expect them to underperform in that timeframe given aggressive valuation. Workday’s move seems appropriate, given its strong position in the high potential SaaS application space. These names replaced some longstanding constituents of the Dream Stock quadrant. Facebook, SAP, Twitter, Tableau and LinkedIn all dropped into the skepticism quadrant, as share prices failed to keep pace with analyst expectations. Given strong recent results, we believe Facebook and LinkedIn are excellent candidates to appreciate in the near term, while SAP, Twitter and Tableau have much to prove. We are adding LinkedIn to our long model portfolio and removing Tableau. Amongst the stocks that moved from Dream Stocks to Comeback Kids, implying downward revisions to 5-year growth expectations that didn’t dramatically hit share price, are Disney, Fox and TripAdvisor. These stocks are at risk of repricing lower. Our long model portfolio underperformed the tech constituents of the S&P 500 by 40bp since March 10, owing entirely to a 44.7% drop in Seagate, which badly missed earnings (Exhibit 20). 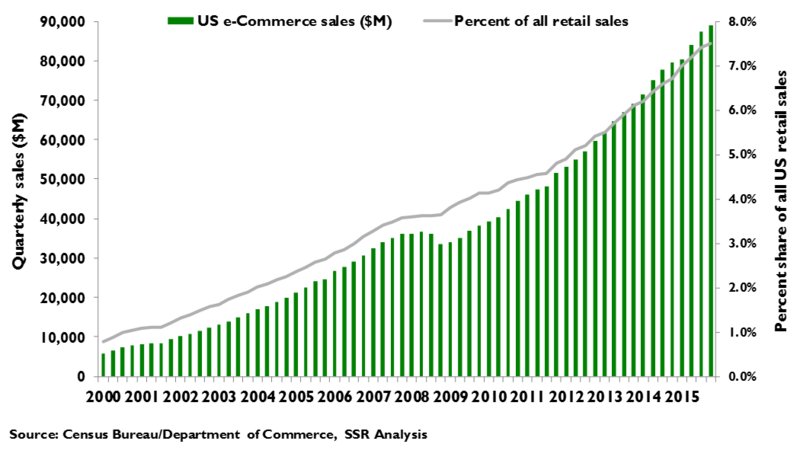 While we still believe that the disk drive market will stabilize, as cloud sales finally offset PC/enterprise systems declines and as industry capacity rationalizes, we believe that the timing of that inflection point is likely still over a year away. As such, we are removing STX from the portfolio. We are also dropping Tableau Software (DATA), which showed a second consecutive quarter of sharply decelerating license revenue. While the stock is actually up more than 15.1% since March, we are concerned that the company is losing market share, most likely to Microsoft’s Power BI product, which sells at a 75% discount to Tableau’s product. In their place, we are adding Mellanox and LinkedIn. Mellanox (MLNX) is small for our portfolio – its market cap is just $1.9B – but we believe that it is extremely well positioned to benefit from a paradigm shift in the networking sector toward simple, cheap “white box” switches. Branded configured switches and routers from the likes of Cisco use custom ASICs at the core of their boxes, but the white boxes increasingly use off the shelf switch fabric chips from Mellanox. We are adding LinkedIn (LNKD) not for its professional social network, but for its SaaS human resources talent management software business. LNKD had been badly punished for missing numbers in February, but posted reassuring results in April. We believe that there is substantial room to further retrace its fall. 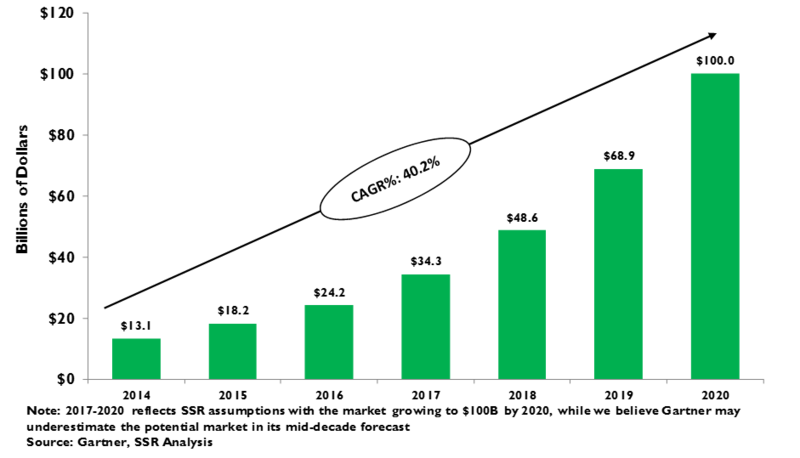 Our short portfolio performed very poorly in its second quarter of existence, underperforming the benchmark by 390bp. While several of our short picks actually showed strong appreciation, the biggest factor was a concentrated bet against linear TV. As we now believe that extraordinary political ad spending will buttress media names against their declining core business through November, we are removing CBS, Charter and IPG from our short portfolio until after the election (Exhibit 21). In their place, we are adding three disparate names. Hewlett Packard Enterprise (HPE) has been a very strong performer this year, drawing aggressive upward revisions. We believe that the strength will be short lived, as enterprise data center spending continues on an irreversible downward trajectory. We are also adding Nuance (NUAN), which supplied the voice recognition technology for Apple’s Siri. Not only will Nuance be negatively affected by ongoing weakness in iPhone sales, but we expect Alphabet to make its excellent voice recognition technology available for licensing to 3rd parties. Finally, we are adding Dish Network (DISH). This company’s valuation rests on the potential value of its US spectrum licenses. We believe that Dish’s failure to strike a deal with an existing wireless carrier or a partner that could fund an network buildout, like Alphabet, could result in a) risky and expensive Capex toward building an all new network on spec, b) selling the spectrum at a discount, or c) forfeiting some of the spectrum for failure to meet license stipulations.